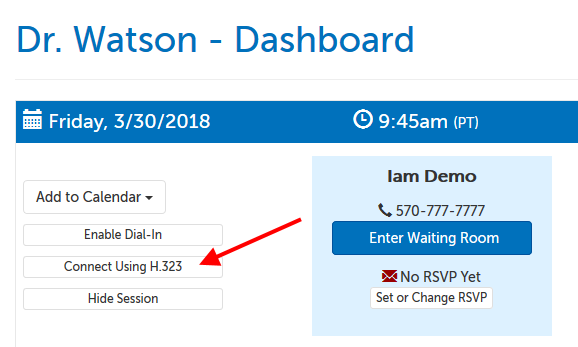 If you do not have an H.323/SIP device, but have a port enabled on your account and would like to test it, you can use an emulator like Polycom's RealPresense Mobile app. 1. If you have been invited to a session with an invite, click on the link in that invite to get to the waiting room page. There will be a button called "Connect Using H.323". Click on it. 2. 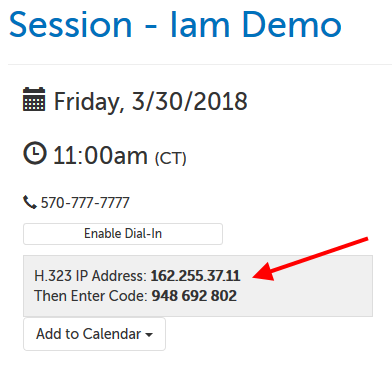 The area will expand with the IP address you will need to connect to and the code (Zoom meeting ID) you will need. Once you dial into the IP address you will be prompted to enter the code and press the pound sign (#) to complete joining. 3. If the meeting has not started yet, please wait for the host. 1. If you have been invited to a session and have an account, log in and go to your Dashboard. 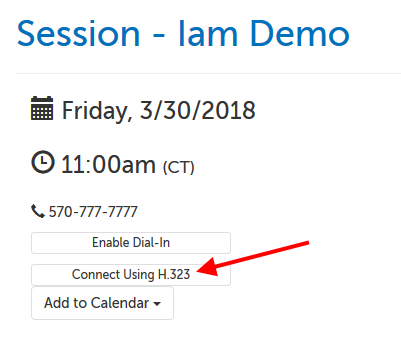 On the left-hand side of the session, there will be a button called "Connect Using H.323". Click on it. This article was last reviewed by our Support team on March 30, 2018.